Click here to enter on Facebook now and be in with a chance to win, it only takes 30 seconds to enter! At 40mm in diameter, each 2012 Silver Britannia contains a full troy ounce (31.1035 grams) of fine silver. With the silver price making steady gains over the past month can you really afford not to enter for a chance to win? Take a look at the 2012 Silver Britannia Coin. Winners will be automatically selected at random from our Facebook competition page located in the left menu at facebook.com/thegoldbullioncompany. Weekly winners will be selected at 2pm, on the 8th, 15th, 22nd and 29th February 2012. Competition winners names will be posted to our Facebook page and to this blog page within 24 hours of each competition draw. Winners are required to check The gold Bullion Faceook page to check if they have won one of the four weekly draws, winners must make contact with The Gold Bullion Company to provide postage address and contact information within 28 days. A Facebook account is required; you can create a Facebook account here. 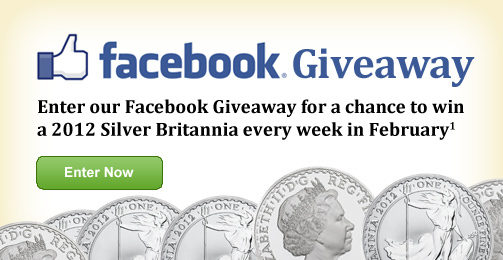 2012 Silver Britannia coins will be dispatched via recorded next business day delivery within 7 days winners supplying full delivery details. Delivery available to UK addresses ONLY.